No one can feel completely safe when a train goes off the tracks. “Train wreck” did not become shorthand for a disastrous situation for no reason. 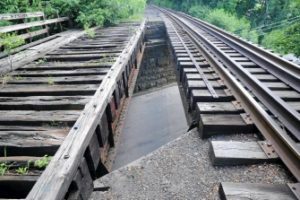 As Virginia-based railroad injury lawyers for going on 40 years, we have seen firsthand some of the worst results from train derailments. We helped several victims of the Norfolk Southern chemical train crash in Graniteville, South Carolina (SC), that released a massive cloud of deadly chlorine gas. We also secured a $60 million award for a man who suffered permanent brain damage after a train literally flew off its tracks and crashed into the gas station service building in which our client was working. The people most likely to get injured or killed in train derailments are, of course, crew members, track workers and rail yard employees. When on-the-job accidents occur, railroad staff have undeniable rights to file claims for the payment of medical bills, lost wages, disability costs and, in the worst cases, funeral expenses and wrongful death settlements. Railroad workers who get hurt or killed while on duty are covered by the Federal Employers Liability Act. Usually shortened to FELA, the law does much of what state workers’ compensation laws do for workers in other industries. The biggest difference is that when a railroad refuses to settle a work-related injury or death claim, the rail employee or the employee’s family must file a federal lawsuit. The case itself can be heard in a state court, but it is essential to hire an attorney who has national experience with handling FELA lawsuits. Federal safety laws control the actions of railroads and violating those laws automatically creates liability. Obtaining critical evidence and company records often requires filing requests under the federal Freedom of Information Act. How to identify the types and locations of records and evidence that might be destroyed or lost will not be obvious to someone working their first FELA case. Most railroad companies operate across state lines, giving them resources a law firm that only takes local cases will lack. Perhaps most importantly, knowing the railroad company usually proves invaluable in successfully countering the arguments and obstructionism of the defense team in a FELA lawsuit. An attorney who has spent decades fighting for the rights of rail employees will have many connections inside a company who can confirm details about a derailment and corporate policies and procedures. An experienced FELA attorney will also be able to call upon a broad range of experts to conduct investigations and testify on his client’s behalf. If you need information regarding your legal rights after any type of railroad accident involving injuries or deaths from a train derailment, crash or release of toxic chemicals, please contact our law firm for a free and confidential consultation. At least 17 of the top commuter and intercity railroads will receive millions of dollars in funding from the US government to increase rail safety with automatic braking systems that are intended to automatically slow down trains that are in potentially dangerous situations. The Department of Transportation stated last month that it would issue $197 million in funding after commuter railroads have opposed looming deadlines to implement the safety systems, known as positive train control or PTC. Congress ordered PTC to be implemented by 2015, but commuter rail systems complained that they lacked the funds to meet the date. The new deadline is now the end of 2018. The new federal funds should help the commuter rail lines to meet the new deadline for PTC, which could reduce the chances of train crashes and derailments. Some of the busiest commuter rail lines in the country welcome the funding infusion. In Florida, the Southern Florida Regional Transportation Authority will get $32 million to install PTC. This is the second-highest tranche of funding for a single commuter rail group. The Tri-Rail commuter line is 72 miles long and runs through the crowded Palm Beach, Broward, and Miami-Dade counties. Also, the Florida Department of Transportation will receive nearly $2 million funding for the Central Florida Rail Corridor. According to Federal Railroad Administration Executive Director Patrick Warren, the federal funds for PTC installation will help some of the busiest commuter railroads in the country to improve rail safety for millions of train passengers every day. In recent years, there have been several possibly preventable train crashes in which PTC could have been a lifesaver. In Hoboken, New Jersey in 2016, a commuter train smashed into a major commuter train station, killing a woman and injuring 100 other people. The train was shown to have been moving at double the intended speed. A PTC system could have automatically slowed the train so that it could have entered the terminal normally. Research indicates that the implementation of positive train control can lead to a reduction in train-to-train crashes, derailments due to excessive speed, train movements through malfunctioning train switches, and unauthorized entry of trains into work zones. Our railroad accident personal injury attorneys in Virginia and North Carolina would like to see PTC installed as soon as possible on commuter train lines. There is no doubt that positive train control systems will lead to a reduction in train crashes and derailments that lead to serious injury and death, personal injury lawsuits, and wrongful death lawsuits. A fatal crash and derailment between two Union Pacific trains in Arkansas on Aug. 17, 2014 was the result of a tired engineer and conductor who were likely both asleep on at least one of the trains, according to federal investigators this month. The dual train crash happened in Hoxie, Arkansas, and the NTSB reported that it could have been prevented by positive train control (PTC), a form of automatic braking operated by GPS, which Congress has mandated to be in place by 2018. The train crash in Arkansas derailed 55 cars and killed a total of two people – both crew members on different trains. The NTSB stated that the southbound Union Pacific train hit the northbound train as it was turning onto another track. The southbound train passed two warning lights and a red signal, but did not slow down. There was no activity in the cab of the train before the wreck. The board did not find the northbound train at fault. Several people on that train were seriously injured. The engineer in the northbound train had moderate sleep apnea that was diagnosed in 2010. We wrote about this fatal train crash in Arkansas when it happened. Our Virginia and North Carolina train crash attorneys have long been baffled that railroads have delayed the installation of PTC on their trains. PTC would automatically stop a train before it can run a red signal or get into another situation that endangers human life. The Federal Railroad Adminsration states that PTC could stop 52 train crashes each year. We hope that railroads will implement PTC before the 2018; it will save lives. Our personal injury attorneys are experienced in wrongful death and personal injury claims in train accidents. 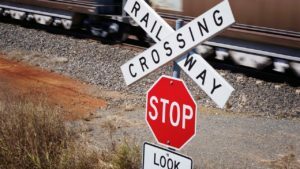 The need for robust state laws involving personal injury recoveries could not be more demonstrated by nationwide railroad highway grade crossing crash cases. While the federal laws provide for it national railroad system, when persons are harmed or killed in railroad crashes, the state laws system supplies the right of recovery for persons that suffer injuries caused by negligence. The engineer who was running the train in Hoboken NJ that smashed into a busy commuter rail terminal, which killed a woman and injured more than 100, told federal investigators this week that he was only going 10 MPH as he approached the station, but has no memory of the crash. The statement from the train engineer, Thomas Gallagher, came as federal investigators discovered that a data recorder on the train that was supposed to record speed and braking data did not work. Investigators say there is a second data recorder but it is under a collapsed part of the station’s roof and they cannot get to it. Federal rules require that commuter trains have a functioning recorder in the lead car, and the boxes also are supposed to be inspected each year. Gallagher stated that he was fully rested and the train was functioning normally last Thursday morning before it crashed. The crash took the life of Fabiola Bittar de Kroon, 34, who was standing on the train platform. The investigation will continue in the coming weeks, and investigators hope they can get to the second data recorder soon. 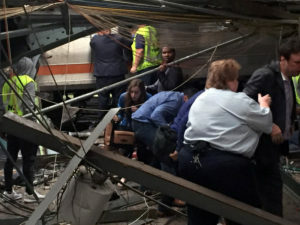 Months before this deadly New Jersey train crash, federal rail authorities have found dozens of safety violations in safety audits that focused on NJ Transit’s safety and operations. From what the engineer is telling investigators, it is possible that he had some type of medical emergency during the crash. Hopefully this will become clearer in the coming weeks. If he did have a medical emergency in this tragic train crash with death and personal injury, this points to the need more than ever of Positive Train Control (PTC) on all passenger trains as soon as possible. This is a GPS-based safety system that can prevent over speed derailments and train to train collisions. PTC could prevent many terrible train crashes and derailments, such as this case with serious personal injury in Virginia that we won a verdict for $60 million. But there’s also another possible simple explanation of the engineer falling asleep and having no recollection of the circumstances. Many safety experts have called for no less than two operators or engineers of not only commuter railroad trains, but on freight trains and passenger trains. In early 2016, a railroad worker who had just been briefed on an upcoming assignment was found dead in a restroom, having overdosed on illegal prescription drugs. In the following months, tests that were done after three railroad accidents found that six employees on the trains tested positive for drugs. In a report done by the Washington Post, testing in 2016 has shown that almost 8% of workers involved in railroad crashes were positive for various illegal and prescription drugs, including marijuana, cocaine, ecstasy, benzodiazepine, OxyContin and morphine. The number of post-crash drug positives was the highest since the Federal Railroad Administration (FRA) started to keep records in 1987. Overall, the number of railroad workers who tested positive for drug use went up 43% in the last year. The number increased to 256 last year from 2014. After rail crashes in 2014, no workers tested positive for drugs, and only two people did last year. With three months left in 2016, 16 railroad workers have tested positive in tests after railroad accidents. Railroads transported 565 million passengers and 14.2 million carloads of freight in the last year. Train workers are some of the most heavily drug tested in the US. They are drug screened before they are hired, and they are tested randomly on the job each year. Still, the report shows that there is strong evidence that illegal drug use is on the rise in the railroad industry. That is why in September 2016, the heads of all major railroads in the US were called to Washington to talk in a closed door meeting about the rise in drug use among rail workers and what to do about it. Officials from the FRA, National Transportation Safety Board and the Office of National Drug Control Policy detailed their concerns about the drug problem and asked the railroads to help them deal with it. One thing that is being changed is that currently, railroad drug testing is limited to 120,000 workers whose jobs are ‘safety sensitive,’ or where lives are put at risk in the performance of their work. Train and track repair workers do not have to undergo drug testing. Federal officials want this to change. They want railroads to start testing these workers as well by April 1, 2017, but so far, industry is resisting a deadline that soon; they have asked for a delay in the additional testing for another 14 months. Railroad accidents, railroad crossing crashes and train derailments are too common in America. As railroad accident attorneys who handle serious personal injury and wrongful death cases, we hope that railroads across the US will start to do more stringent testing of all railroad workers for drugs. After all, when a serious train accident occurs, massive injuries can occur, such as in this $60 million verdict our Virginia railroad accident lawyers handled when a train derailed in Manassas VA. 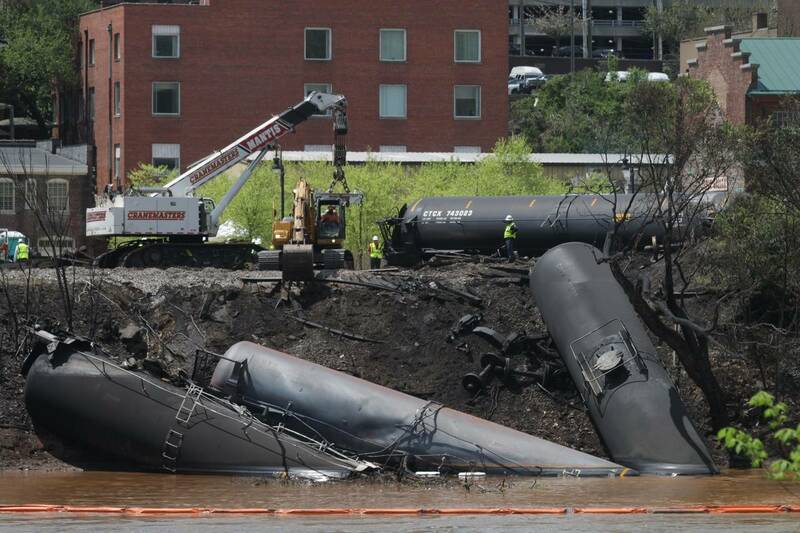 If drug testing could reduce the likelihood of this type of train accident, we are all for it. A New Jersey Transit train crashed and derailed as it arrive into Hoboken Terminal just before 9 am on Thursday morning. The rush hour train crash killed one person and injured more than 100. Images posted on social media showed that the train tore through a wall and severely damaged the station, leaving train debris strewn about and twisted metal columns after the wreck. According to witnesses, the train pulled into the station traveling far too fast, overrunning its stopping point. It slammed into a bumper block, went airborne and slammed into a passenger concourse in the terminal. One witness who was in the front car told the media that the train did not appear to slow at all as it came into the station. Another passenger on the train stated that the train did not brake at all when it entered the station. The woman who died was Fabiola Bittar de Kroon, 34, from Hoboken. She died when she was hit by debris while standing on the platform. The engineer’s name is Thomas Gallagher, 48, and he was treated and released from a hospital. He is cooperating with investigators on the train accident. Some federal lawmakers said after the crash that positive train control could have helped avoid this tragedy. The system combines GPS, wireless radio and computers to monitor trains and to stop them automatically from crashing, derailing or speeding. New Jersey Transit has not yet installed PTC. The deadline set by Congress to install PTC in all passenger trains has been extended until 2018. The train’s event recorder has been recovered and NTSB investigators are analyzing its contents. Our personal injury attorneys send condolences to the family of the woman who was killed in this tragic Hoboken train derailment and crash. It is too early to speculate about the cause of this train accident, but it is alarming that the train apparently did not slow at all as it entered the train station. Whether the engineer fell asleep, was texting on a cell phone or had a medical emergency, there is little doubt that PTC could have prevented this train accident in Hoboken and could have saved a life and prevented many serious personal injuries. Positive train control has gotten much attention ever since a 2008 Metrolink train crash in California that killed more than 20 people. President Bush signed a laws that required PTC systems to be installed by the end of 2015, but unfortunately, railroads lobbied to get that deadline extended until 2018. Other safety experts have pointed out that if the railroads or commuter train companies were required to have two crewmembers in the engine or in the forward car, it would prevent tragedies like this where a single crew member gets distracted or falls asleep. Our hope is that this train crash will serve as a wake up call for railroads to stop dragging its collective feet and get PTC installed on its trains as soon as possible. Two BNSF freight trains slammed into each other on the same track outside of Amarillo TX, with at least one railroad worker injured and three missing. According to a spokesman for the Carson County TX sheriff’s office, the chances of finding the missing crew members alive is low. The two train crash happened at 8:25 central time on Tuesday near Amarillo. The trains were carrying consumer goods and the wreck happened on the main line, which is called the Southern Transcon that connects Los Angeles with Chicago. Experts say that while the investigation is in the early stages, it appeared that this type of accident could have been prevented if positive train control technology had been used. Railroads got an extension last year on implementing PTC until 2018, after most railroad were unable to meet a 2015 deadline. The system is designed to stop trains automatically when they are in an incorrect position or do not observe traffic signals. BNSF stated that it intends to install PTC on the section of track where the accident happened. Our hearts go out to the families of the injured and missing men in this train accident. As railroad accident attorneys, we know that many railroads have been delaying the implementation of PTC to save money. As I once wrote, this is an absurd argument when you consider the costs of upgrading safety equipment compared to the costs associated with the type of train crash above. It is estimated that 20 year installation, testing and maintenance costs for PTC would be as much as $24 billion. That is a great deal of money, but the above wreck is going to cost BNSF millions and millions of dollars in property damages and government fines. Also, there will almost certainly be very expensive wrongful death lawsuits for the men who are missing and presumed dead. Our railroad accident attorneys think that railroads should put PTC systems into their trains and infrastructure as soon as possible, even if profits are reduced for a few years. Such actions would help railroads to avoid massive lawsuits that can cost them millions of dollars.